A new era of passenger airplanes travel seem to be an idea of the future, BUT an idea that may actually take form! 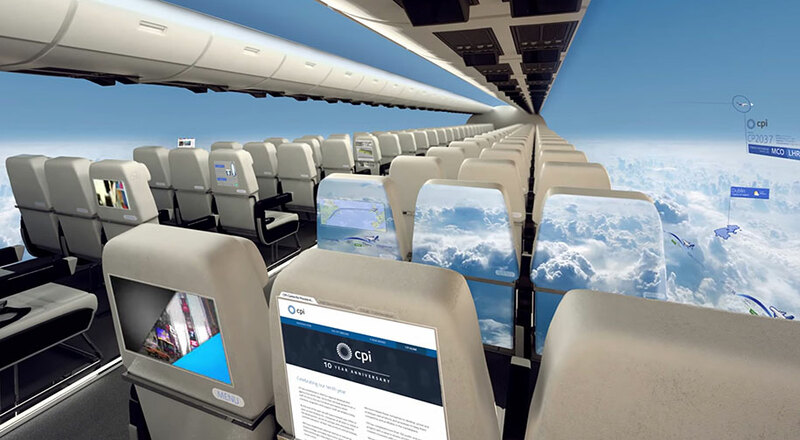 A UK-based tech innovation company Centre for Process Innovation (CPI) has unveiled a new concept for planes with the windows replaced with display screens stretched out throughout the entire fuselage. If the concept is to become a reality (the company believes it could happen in 10 years), it could benefit passengers, manufacturers and the environment. Windowless airplanes would allow the aircraft to have thinner walls that would make them considerably lighter, allowing them to consume less fuel. The reduction in fuel consumption would reduce the planes’ CO2 emissions, making them cheaper for manufacturers, airlines and passengers. The OLED touch screens would cover the passenger plane’s entire interior, including the backs of the seats. The ultra-thin and flexible screens would broadcast the actual view from around the aircraft and produce cabin lighting and also let passengers access touch screen entertainment. However , those with a fear of heights or flying may never want to fly again, FOR GOOD, as a panoramic view of the skies might be too much to handle! The night time views would be an amazing experience. The Video/ Commercial for this futuristic innovation is quite convincing. What a wonderful time to be alive!! !